There are various types of macular degeneration that we help diagnose and treat at our Northeast Philadelphia eye care clinics. However, the most common form is associated with aging, this eye disease is also called age-related macular degeneration (ARMD). 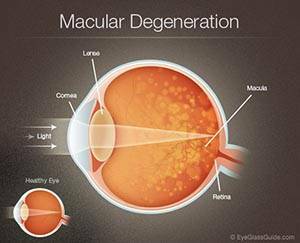 What can I do to protect against macular degeneration? 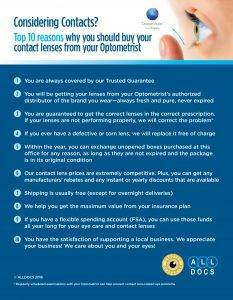 There are a number of ways that we suggest to help protect against macular degeneration. Lifestyle is an important factor. Eating well, diet, and avoiding smoking all play an important factor in eye health. Genetics are also a factor and many times getting this eye disease is simply something you can't avoid. Eating leafy green vegetables such as spinach, kale, and broccoli help provide nutrients that are important to the eye. For our patients who already have macular degeneration or have drusens on the eye, we suggest taking a vitamin called MacuHealth. This is a vitamin composed of the three vital pigments in the eye, called carotenoids. Taking these supplements help block out excess blue light from reaching the retina which, in turn, can help protect against developing macular degeneration.